Is that Seoul's modern architecture or September 11th? 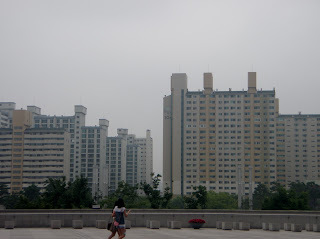 Seoul's older apartments thrown up after The Korean War are nothing in comparison to "The Cloud's" modern look. 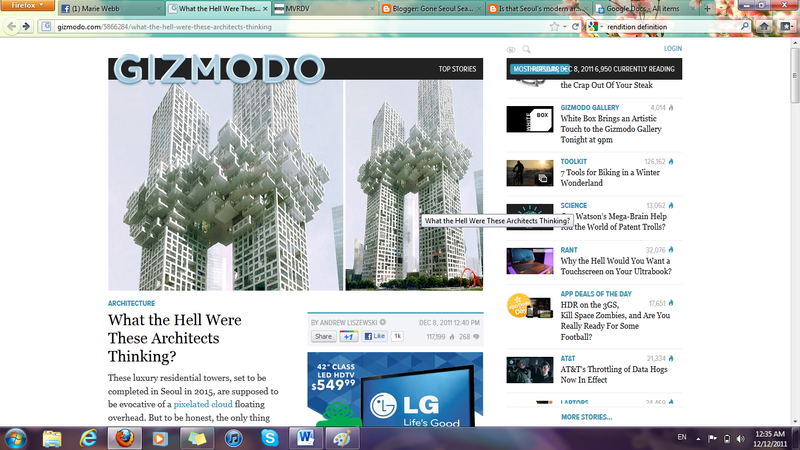 Screen shot courtesy of www.gizmodo.com. 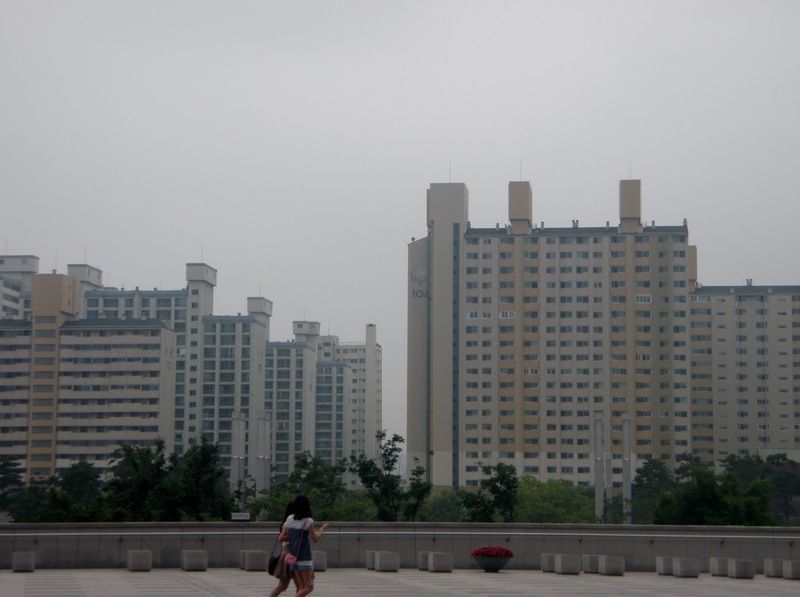 Typical Seoul apartment buildings have no style. Architects at MVRDV posted on their website stating our company "regrets deeply any connotations The Cloud projects evokes regarding 9/11." Unfortunately, the companies newest project in Seoul "The Cloud" apartment buildings have been a scrutinized topic all over Facebook for the past week. In my personal opinion, I love what the architects have done; at least the building is not another rendition of the horrible apartment buildings thrown up in the 1950's after the Korean War. Whenever someone witnesses the rows of lackluster apartment buildings in Seoul or anywhere else in Korea they are shocked. The older buildings have absolutely no exterior appeal and were built simply to maximize space and house people after the war. One of the first websites to publish an article about the buildings in relation to 9/11 was www.gizmodo.com. Author Andrew Liszewski wrote that the only thing the buildings remind him of is September 11th. To be frank, I also thought the same thing but I think it was mostly due to the title of the article I read. Maybe if the article had been titled "The Cloud is set to be completed in 2015" I would have had a completely different viewpoint of the buildings. Answer a simple survey below as to whether or not you think the building looks like its floating in the clouds or looks like a rendition of 9/11. Boy, it's damned if you do and damned if you don't. It's true, the older apartment blocks (until about the middle of the previous decade) were usually utilitarian and industrial-looking, though often nice on the inside. I own a small apartment in an older structure from the 1980s, and there is absolutely nothing that distinguishes my building from the other four, except for the numbers on the side. But then when Seoul tries to shake things up and have funky and unique architecture, typically from foreign architectural firms, it's derided as ugly or way-out or now this.